One of the biggest lies I was told by my idiot classmates in elementary school was that Thailand was the same thing as Taiwan. Skip forward to summer, I’m fresh out of school and ready for a great summer with a steady sleep schedule without surprises. Then, without warning, that flight creeps up on me and the next thing I am consciously aware of is the fact that we’re sitting in a dimly lit blue shuttle bus as we make our way to LAX, barreling down the freeway as my brother drools over my lap. After 11 hours in the air and a security checkpoint in Seoul, we land in Thailand with aching butts and jet lag. It’s always beautiful. And it’s always full of traffic. And I always get crammed into the back of the van with the suitcases as we move to my uncle’s expensive condo in the city. Bangkok is a great city. You have the yearly monsoon season that makes the best puddles (monsoon season came early once), great food, and a moderately high crime rate perfect for family vacations. If you don’t take a panorama of the skyline you’re missing out on a lot. The city just stretches out around you in a never-ending jungle of concrete and cars. Thailand is really diverse. Drive out for 5 minutes blindfolded and you can find yourself anywhere. Although most people who do this aren’t the ones driving. If you want to experience more of Thailand then you’ll need to jump out of the comfy no-mosquitoes-nice-Traditional-Thai-music-on-speakers-by-the-beach-with-good-spas-and-a-breakfast-buffet and get ready for an absurdly long car trip into the less tourist-frequented parts of Thailand. That means no tours or maps or good plans. It’s just endless car rides and a periodic stop at an Amazon Cafe by a 7-Eleven. Eating seafood by the sea in a place illuminated moodily by lamps is more preferable to scarfing down an all-you-can-eat buffet filled with tourists trying to pictures of every goddamn thing in the room. If you still want the comfy hotel experience you should consider location. Traveling is about being out and about, not staying in a hotel all day. Travel out of your comfort zone. Enjoy the food. You can scarf down meals every day and still get thinner, clear up your complexion, and feel healthier. Non-microwave cooking does wonders in general. Thai food has a lot of flavor, and you also get those 5 major food groups. The variety of tastes is unbelievable and can kill your unhealthy cravings in a couple days. 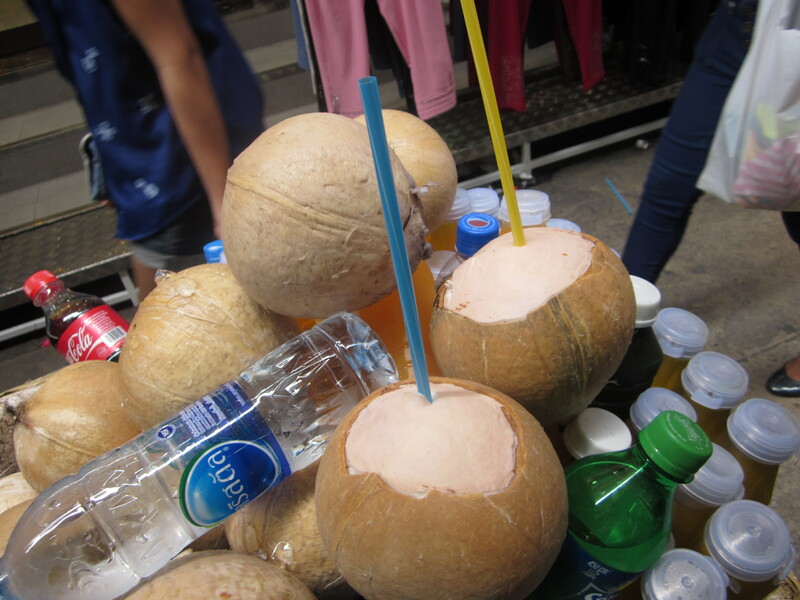 If you go to an open-air market you should also try a fresh coconut. (But it might be room temperature.) By open-air market I mean a market that smells like piss and fish, not a modern refurbished “100 year-old” market crowded with people that smell like body odor and fish. Another thing to note is that people sell stuff anywhere. Residential and business areas have no laws forcing people to get permits or to live separately from their business. It’s normal for people to have a store and past the flight of stairs the weird market smell is suddenly gone and you’re in a fully fleshed-out house right above the store front. People don’t stay humble for very long and you’ll get caught up in your life filled with pristine restrooms and non-smelly markets. You’ll forget that gigantic newts even exist and you won’t need to watch where you step when you go the restroom at night. You’ll either forget the trip and complain about useless things or you’ll become a snob who thinks they’ve transcended everyone else because you went somewhere for a couple weeks. Go experience some information overload and don’t be a jerk about it.